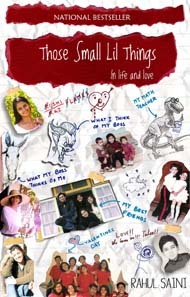 "Those small lil things". What made me choose this one,well there were some photo snippets that made it more realistic and there were pretty girls too ;-). So i had to believe the story must true to some extent and storymode will keep me occupied . This book is good time pass book .You wont have and everlasting changing effect but will kill your journey time.It's good for light reading and if you are not author specific and looking for something new.It's good to go.